Summer is here, and that means more use of sunglasses! A classic look is always pretty, but for people who want to have something more special or to stand out a little more, there are also other models of sunglasses. A recent trend are the colored sunglasses and sunglasses in shapes and prints other than the usual. I have gathered a few examples from both high-end brands and more affordable pieces. The first one here is from Ray Ban and is a model with colored glasses (available in other colors). The bottom left one is from Coach and has a print on the frame. The bottom right one is from Tory Burch and has a more classic black look. Here on the top left you can find another one from Ray Ban and this one has a red frame. 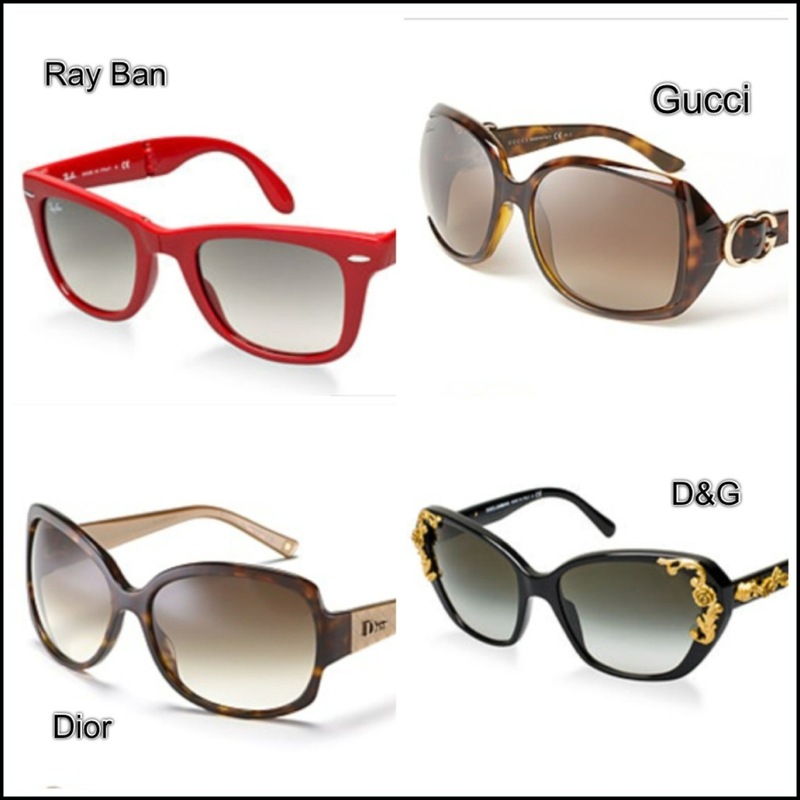 The ones from Gucci and Dior both have a printed frame buth they also have a bit of a classic look. For people who want to have a more bold pair of sunglasses, is the bottom right one from D&G a nice piece. For those who want a pair of sunglasses that are in trend this season but don’t want to spend a ton of money, I also found some pieces that are more affordable. These four sunglasses can be found at Target. 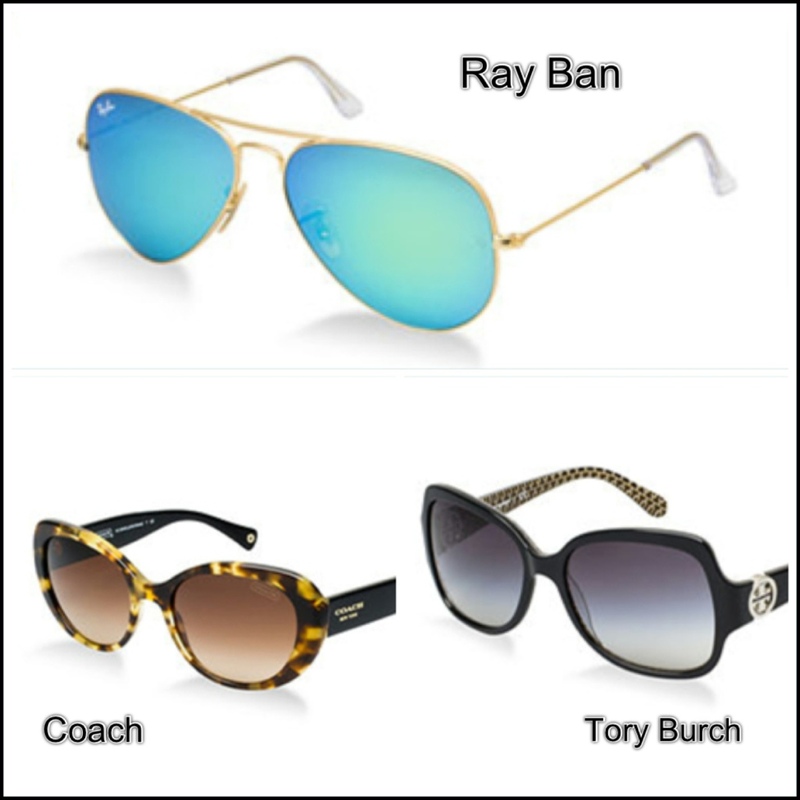 They have a wide range of sunglasses and most of them can be found in stores and online. The four pieces displayed here are not the classic sunglasses-look, they all have a little twist, going from prints to mint-green colors. 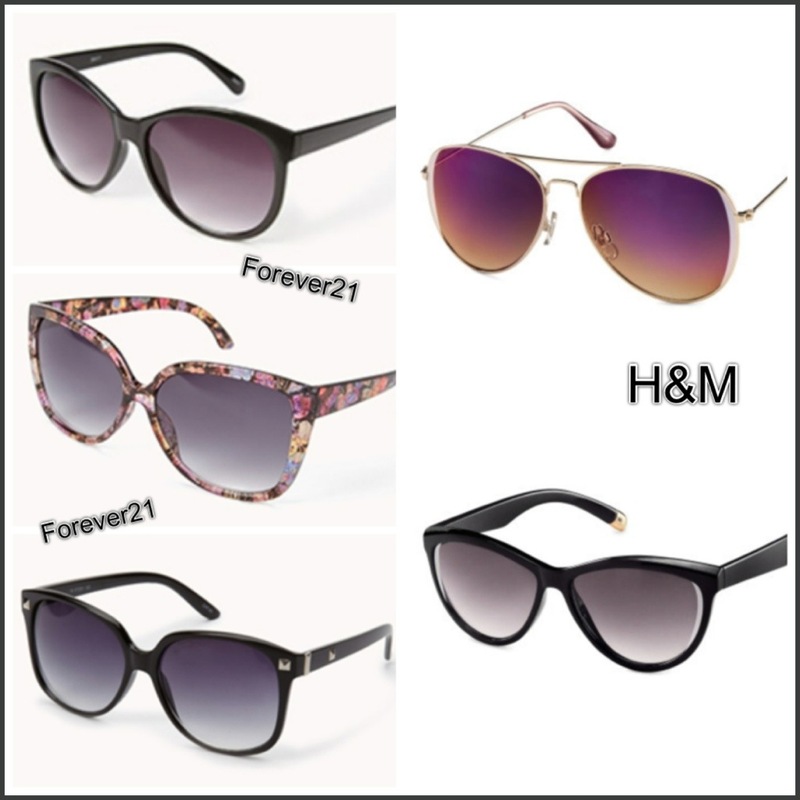 Here are some examples which can be found at Forever21 and H&M. You can find the regular black ones both at Forever21 and H&M. Colored ones can be found at H&M, like the ones displayed here at the top right corner of the picture. The middle one at the left side is from Forever21 and has butterflies on it. 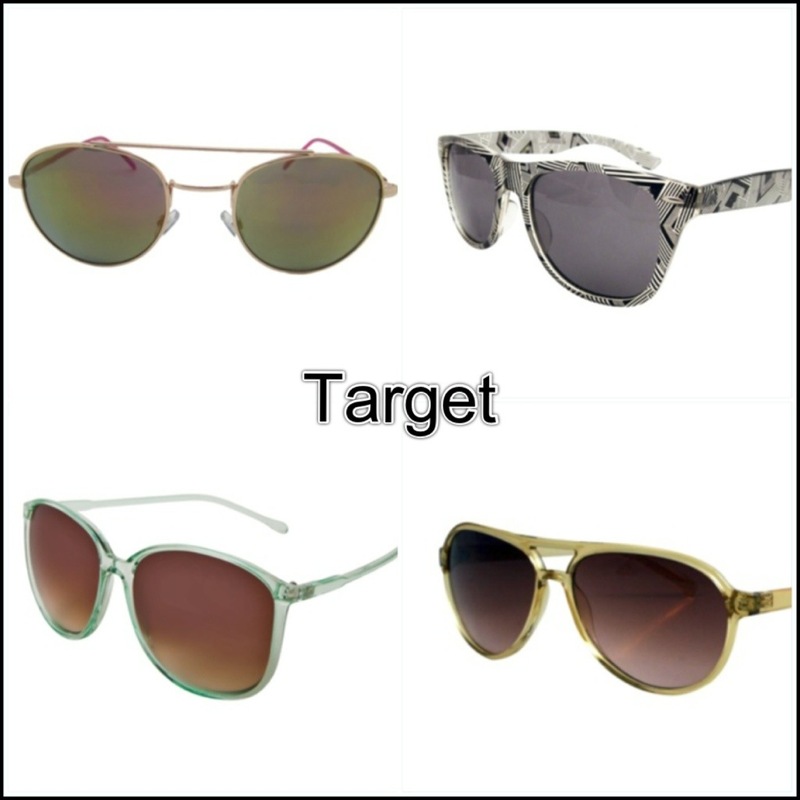 In these bigger retailers you can also find other styles of sunglasses. Colored frames, floral prints, other types of prints, colored glasses, … You name it, chances are big you can find a cute piece for a good price. What’s your favorite? Do you go for a classic look, or do you want a special pair? If you want more beauty, fashion and personal experiences related blogs, be sure to subscribe to my blog! This entry was posted in fashion and tagged Coach, color, D&G, Dior, forever21, Gucci, H&M, print, Ray Ban, Sunglasses, Target, Tory Burch by missnathaliexo. Bookmark the permalink.